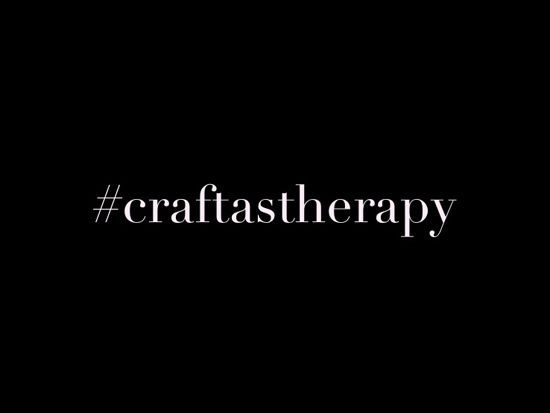 The #craftastherapy hashtag on Instagram is quickly approaching 500 images. 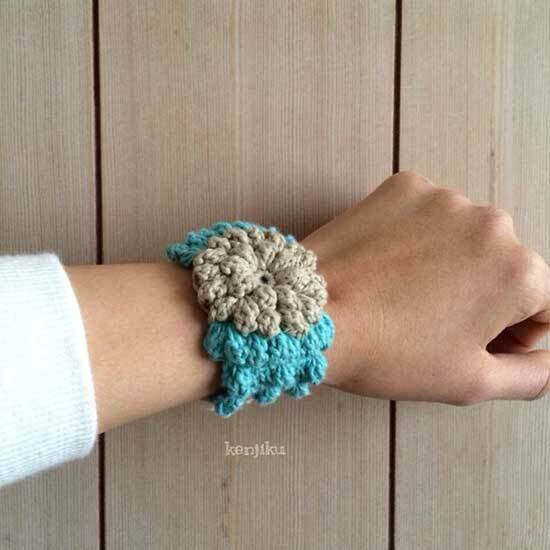 I am really chuffed that so many creative crafters are using the hashtag to show off their handmade pieces. 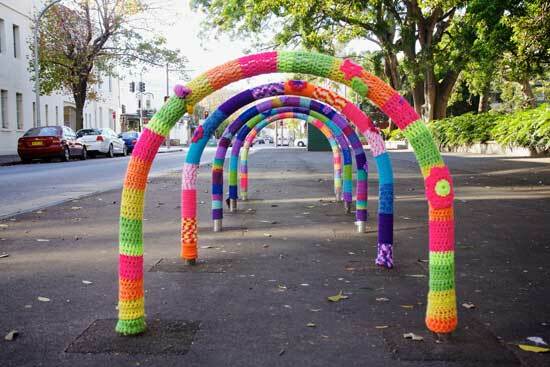 Crochet is obviously flavour of the month and fills most the feed, but that’s ok with me. There are some seriously talented ladies who know how to use the hook!! Here is a selection of my favourites from the feed. Enjoy!! 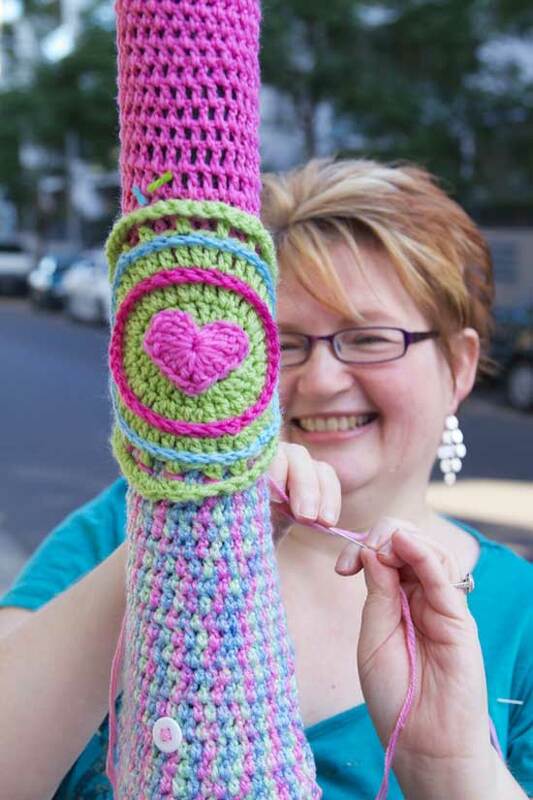 When I contacted Jane to ask her to be my first #craftastherapy story, I really didn’t know that much about her, but I knew she battled a chronic illness and used crochet as therapy. 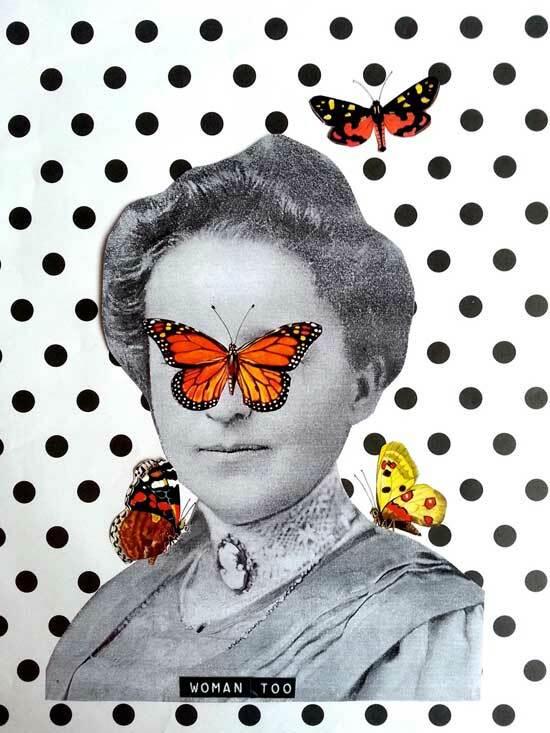 After she sent through her story, I sat down to find some images to accompany her words. 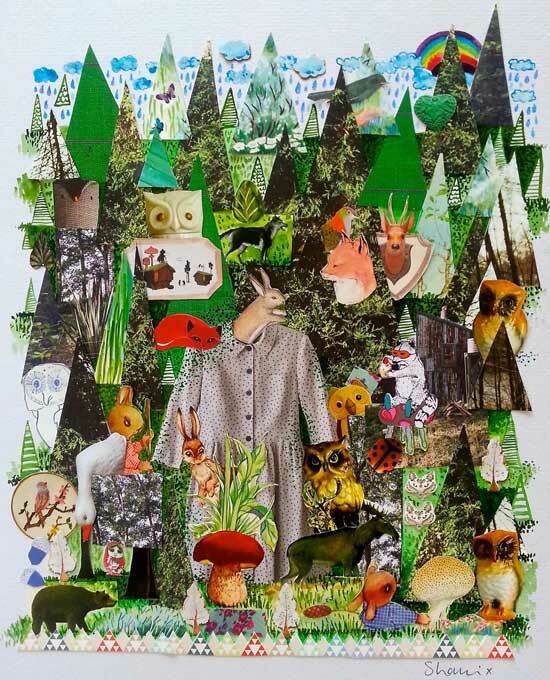 The images were easy to find, but I found myself distracted and lost (in a good way) wandering through her social media world. I began to see there was a lot more to Jane than I initally thought. While her story about her battle with Fibromyalgia is a moving one, her zest for life and generous nature is what struck me as her most defining characteristic. While many people of perfect health live in a constant state of negativity, it is beyond inspiring to see someone like Jane, living with chronic illness and being grateful for every moment. You can find Jane in many places online, so please take the time to look her up. You’ll be glad that you did. 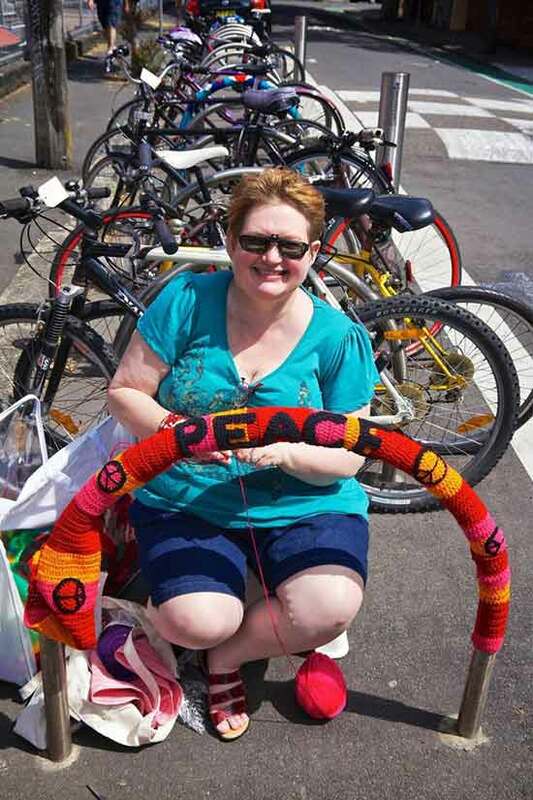 She’s a member of Yarnbombers United, a small group of creative friends who have completed various yarn bombing projects. You can find her Facebook page here and don’t forget to hunt her down on Instagram! Here is Jane’s story – in her own words. Getting a chronic illness was like waking up on a new planet. Gravity suddenly worked differently and my balance was thrown off. I learnt to adapt to completely unknown situations, daily challenges and the unpredictable. Added to this I had to survive constant pain, exhaustion, isolation, disbelief, insults, experimentation by well meaning doctors and not knowing what my own body was going to do on an hourly basis. I needed a coping mechanism, a wall of defence and so turned to creative ideas. 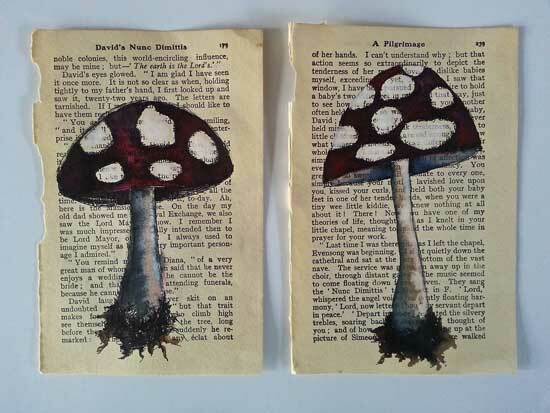 I painted, sewed, decoupaged, grew herbs in creative patterns, made soft toys, tried aromatherapy, candle making, quilting, card making, stamping, stencilling, baking, cake decorating, scrapbooking, beading, jewellery making, photography, digital art, crochet, yarn bombing and now machine knitting too! 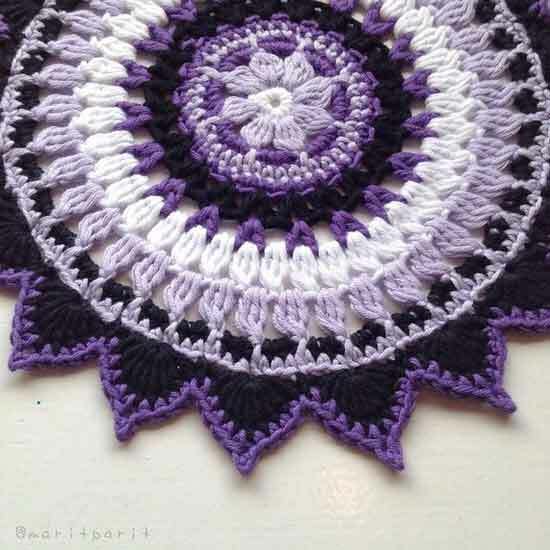 After more than 2 decades of chronic illness, crochet keeps me going. It is both a creative outlet and a meditation. Craft is my therapy. It saves my sanity and allows me to cope with life, illness and depression. 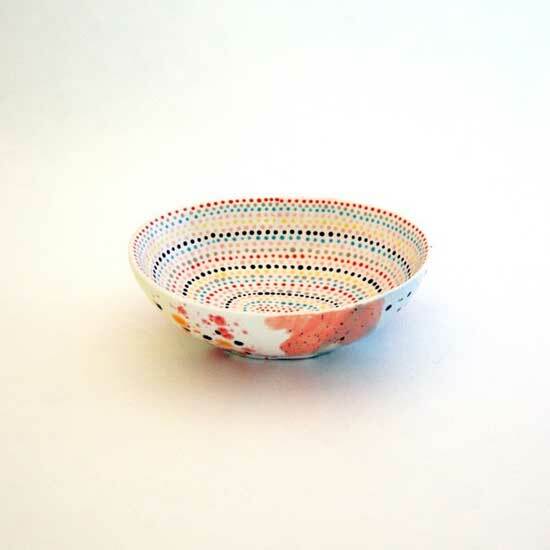 It has also allowed me to meet like minded people in craft groups and in social media. 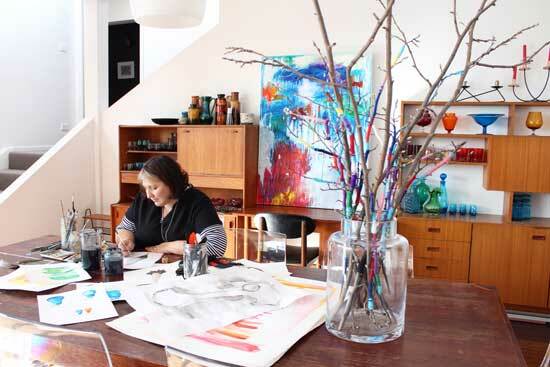 It is a way of connecting with others and expressing your artistic side. I encourage everyone to find a hobby they love. It doesn’t matter if you are good at it or not, as long as you enjoy it. Get creative! 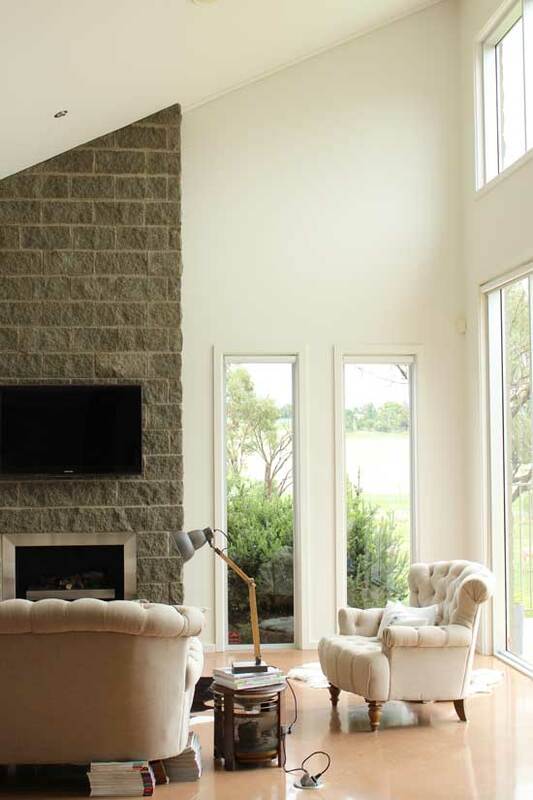 Are recycled interiors suitable for a modern home? I think so. We moved into our modern home almost 12 months ago and have slowly, but surely been putting our stamp on the place. Even before the boxes had been unpacked, i had decided that i wanted to include my love of vintage and secondhand pieces into our new home. 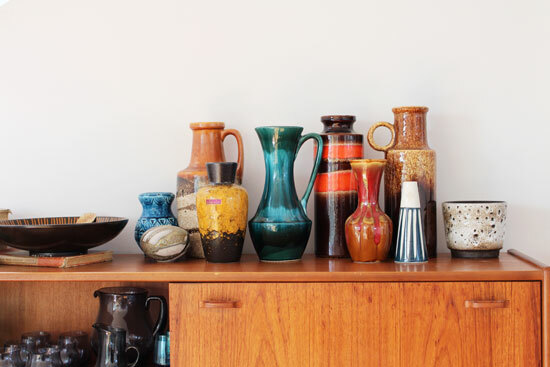 It was suggested that i probably wouldn’t be able to do that in such a modern setting, but i was determined to use some of my existing pieces and find more vintage treasures to include in our modern setting. 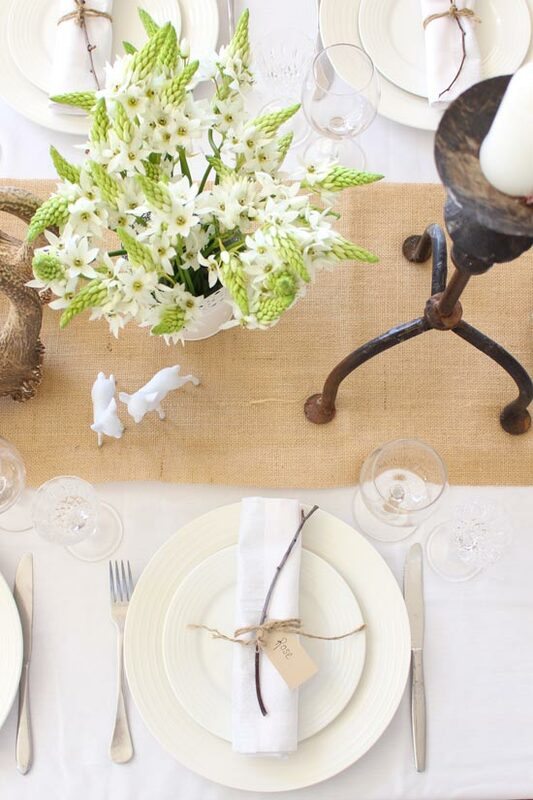 While i have no doubt that vintage pieces can be used in a modern setting, you do need to be selective and have a good mix of different decor items. 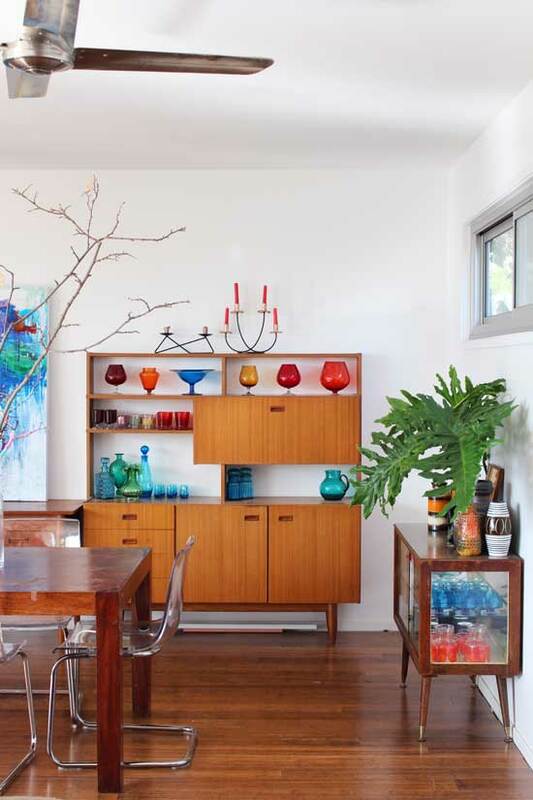 I was mindful of the fact that not everything would work, but looking around there are lots of recycled items in my home that look and feel modern. You just have to be careful about getting the balance right. 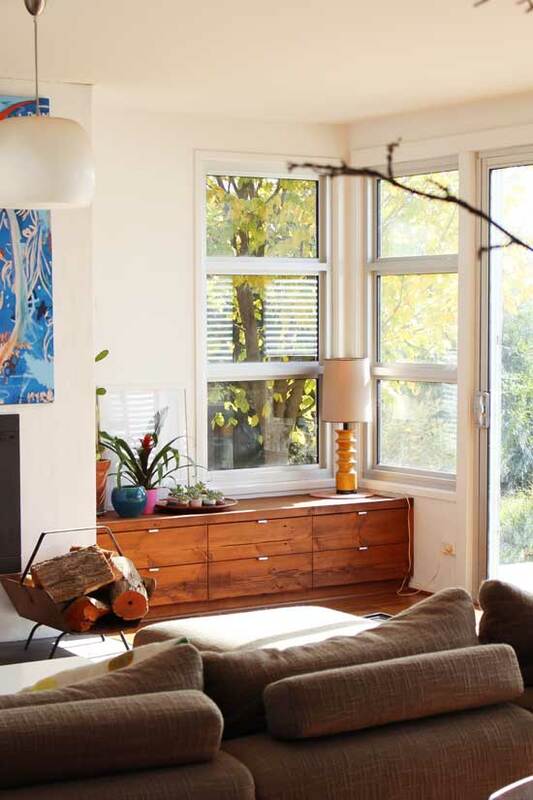 This vintage air circulator (which still works) was the perfect solution for a small side table near the lounge. 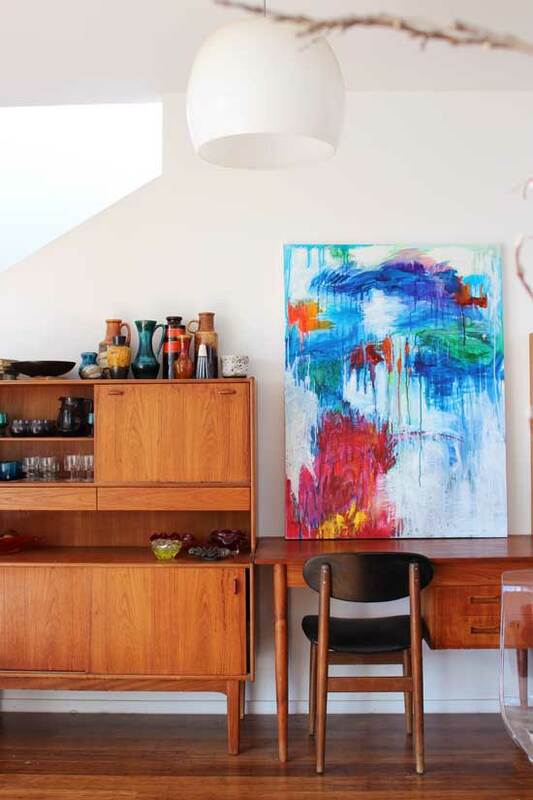 A modern lamp sitting on top of it, contrasts nicely. And, how to fix a broken lounge leg? With old magazines of course! Okay, it is not the most profession repair job, but it is as solid as a rock and other good form of recycling. My husband already owned a couple of much cherished vintage maps and there was no chance of them being left out of the mix. With many large windows and few blank walls, i was limited to only a couple of places in which the maps would fit. 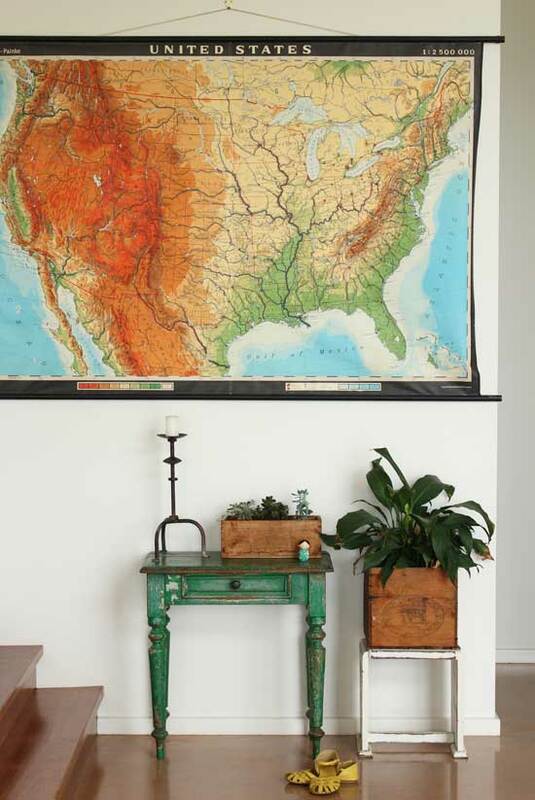 This vintage map of the states hangs proudly in our main living area. 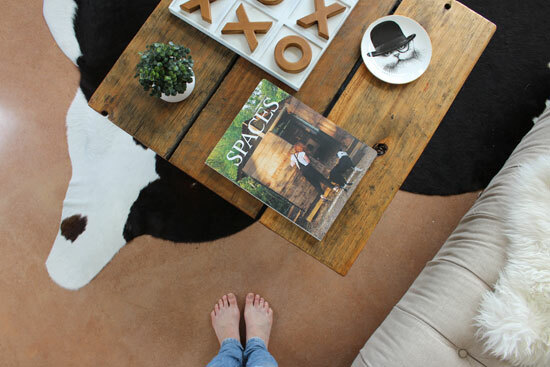 Underneath are a couple of vintage crates, used as planter boxes and a gorgeous green french desk. I think the contrast of these aged items works well in a modern setting. A much treasured vintage school desk we already own had to be included in our new home. It works well in the modern setting as the colour of the wood just happens to blend perfectly with our wooden steps. 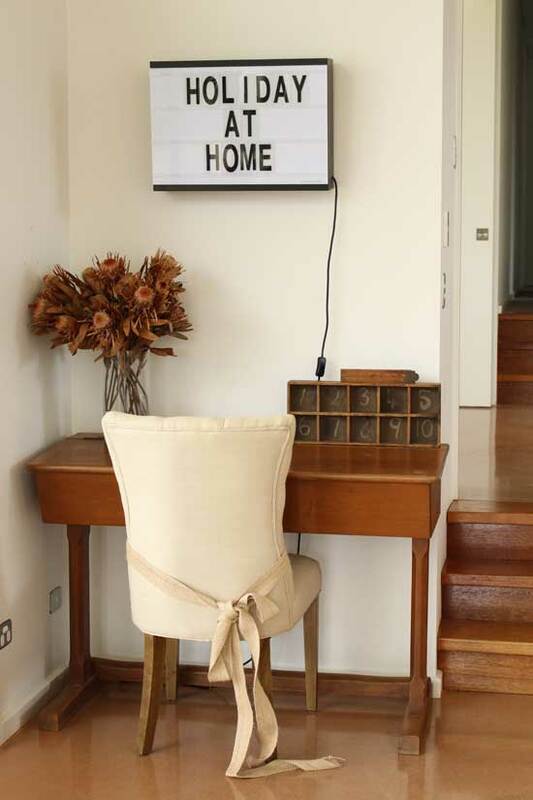 A modern light box, hanging above the desk, maintains the modern feel of the space. My most treasured antique find, an aseptic dental cabinet takes pride of place in our main living area. It has quite an industrial look about it, so it was easy to incorporate into our modern setting. 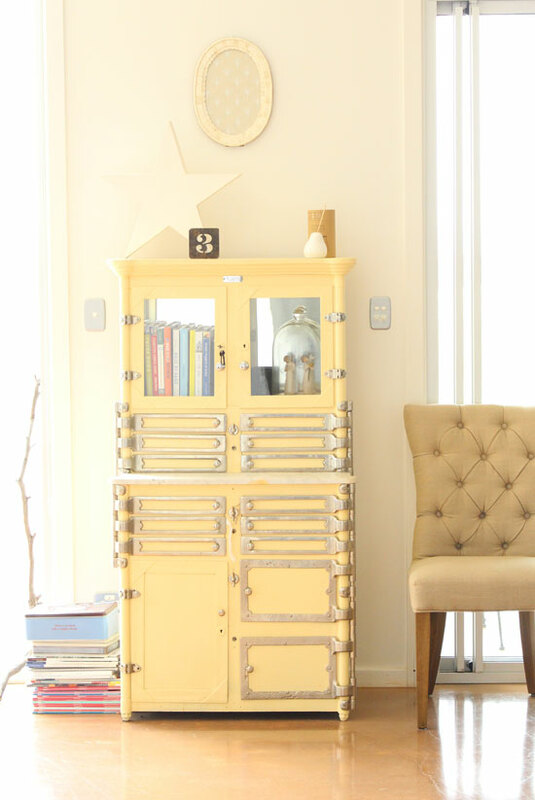 A vintage number three sits atop the medical cabinet – my hubby loves the number three and it doesn’t look out of place here, despite its age and being covered in rust. 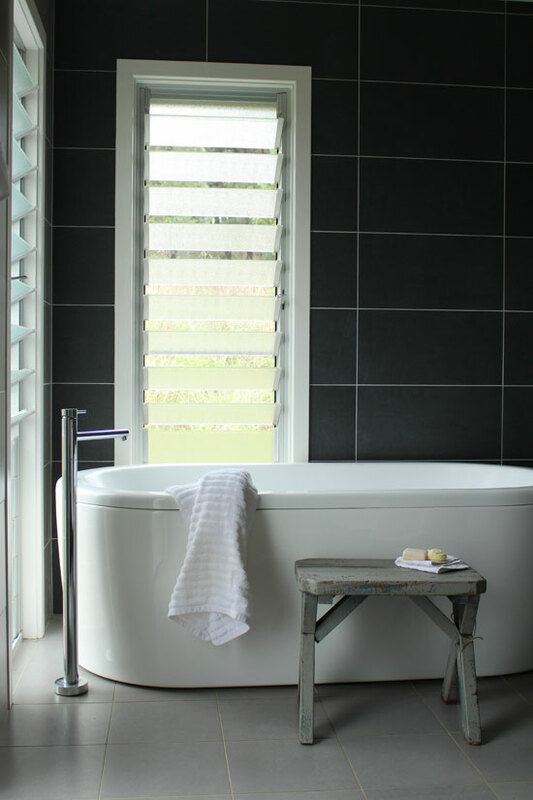 I love the contrast of my old vintage stool in our sleek and modern bathroom. 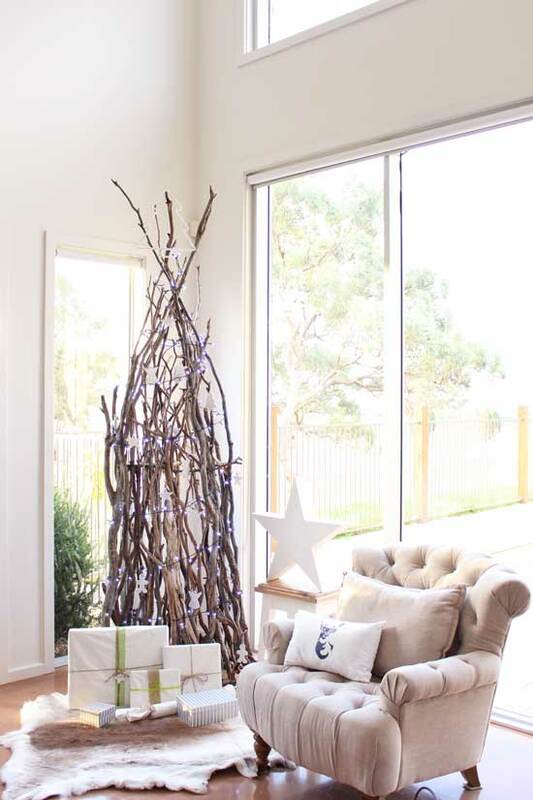 Being environmentally aware when decorating doesn’t mean your entire home needs to have sustainable design and all recycled furniture (that would be great though). We can all contribute to a more sustainable way of living in small ways. 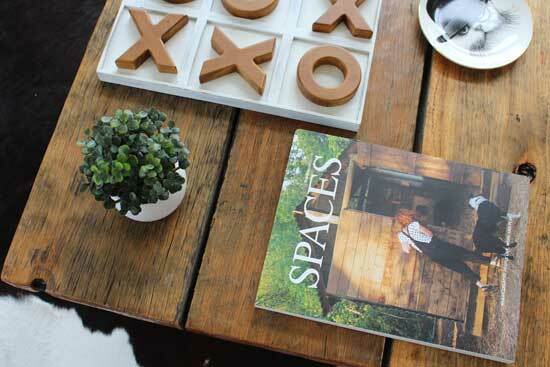 Don’t go out a buy a new stool if a secondhand one will suit your space. 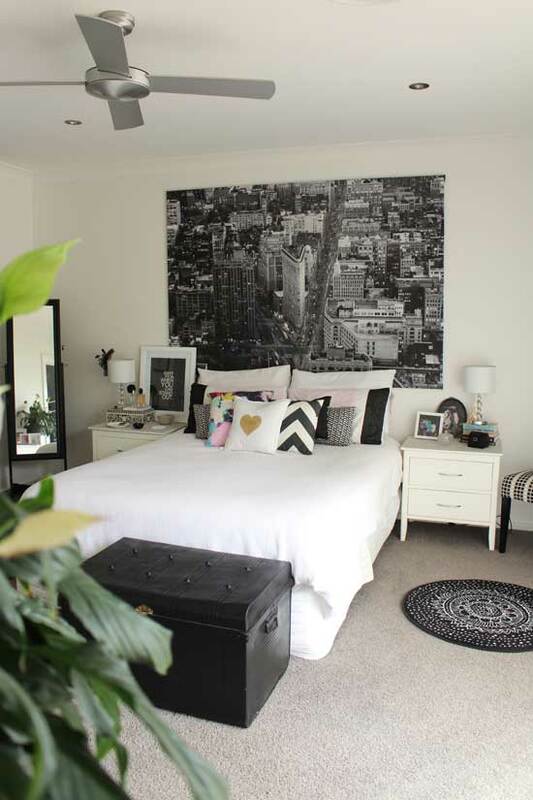 My bedroom is decorated in quite a modern style, but i have still included this old vintage trunk in the design. A simple makeover with shiny black paint has brought this trunk to life and given it a modern feel, that fits beautifully into my bedroom. 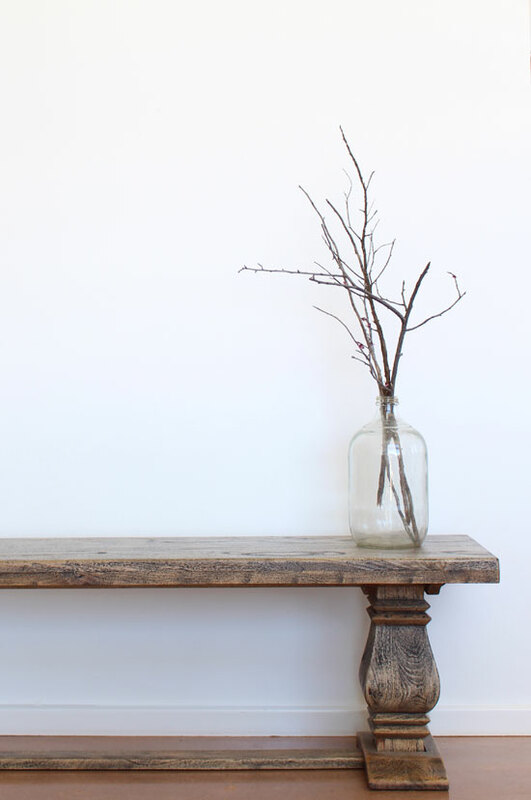 My last recycled find that i wanted to share is this beautifully made coffee table – created with old railway sleepers. This was an absolute bargain on ebay for $50. I love it! I had it in storage when we lived in our previous home because it didn’t suit, but it looks perfect in our new home. 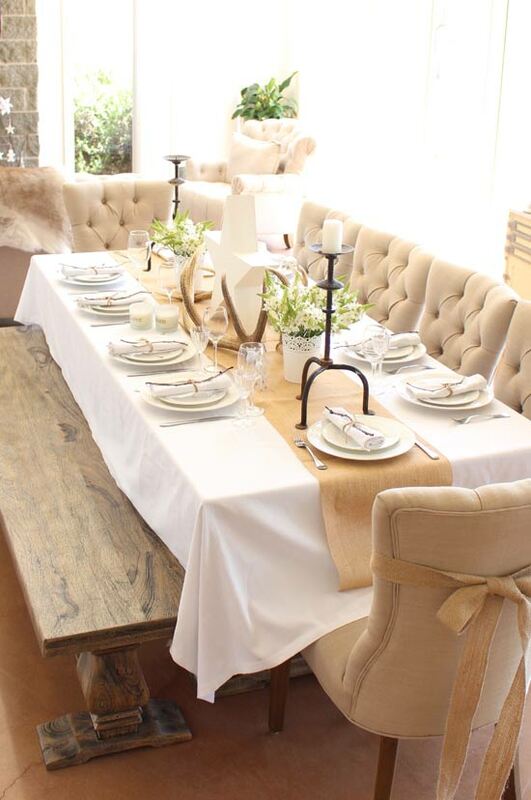 Rustic, warm and recycled. What do you think? 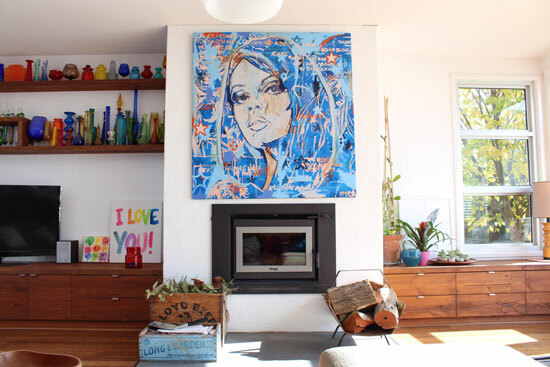 Can recycled pieces work in a modern home? I am really excited to introduce the #craftastherapy hashtag on Instagram. Over the past few years crafting and creating has become a huge part of my life and has helped me get through the toughest of times. 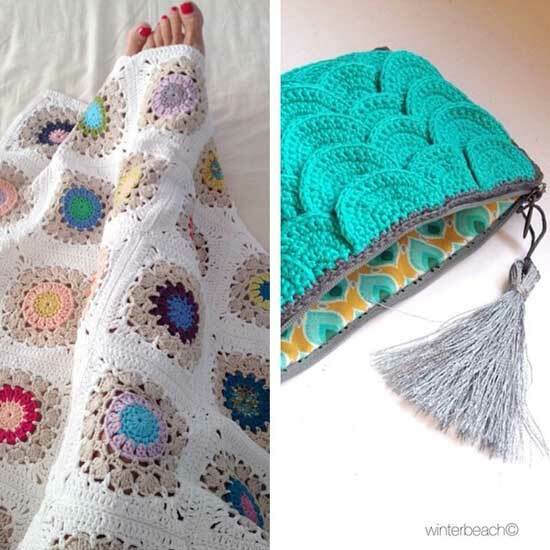 I have spoken to a lot of fellow crafters about the benefits of using craft as a method of therapy and so many agree that time spent crafting is relaxing and therapeutic. 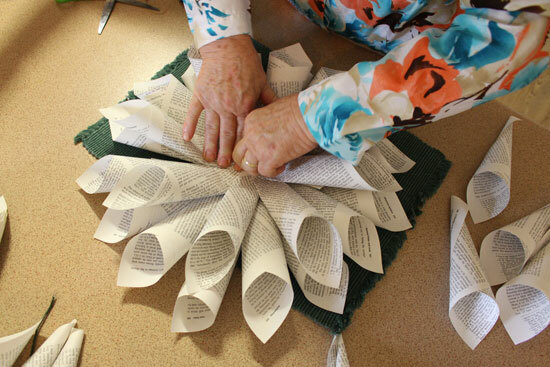 I have heard many stories about how craft has helped provide stress relief during mental or physical hardship. 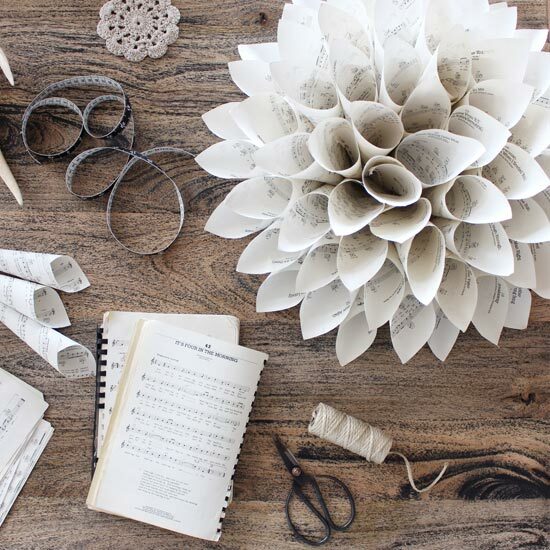 Whether it is learning a new skill or revisiting a previous hobby, time spent creating is good for the mind and body. A number of clever, crafty instagrammers have already started using the hashtag. 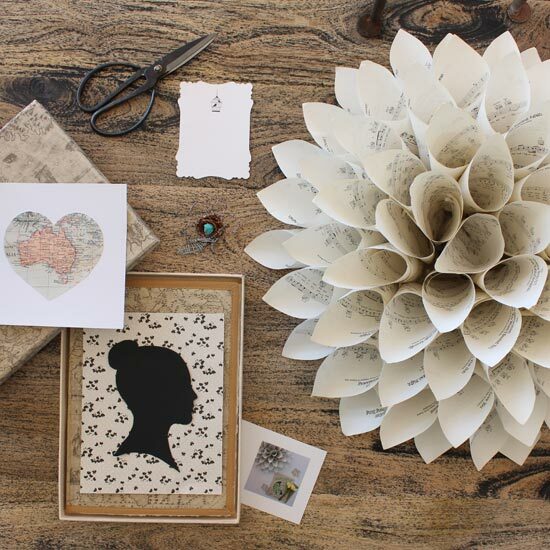 The #craftastherapy feed is filling up with inspirational and beautiful images. 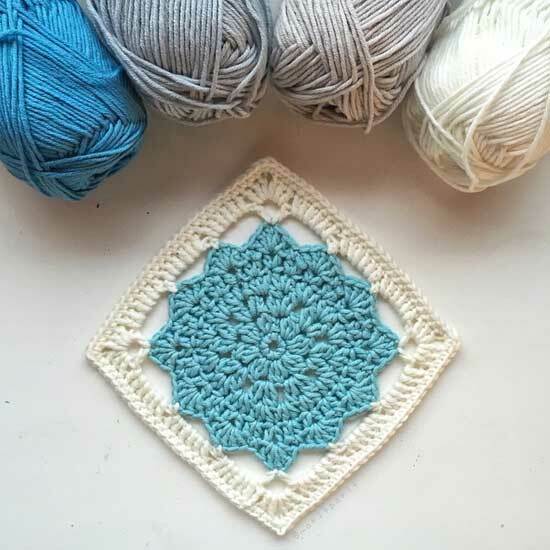 I hope to share projects here on the blog from the #craftastherapy feed, so please feel welcome to join in and tag your crafty projects with this hashtag. Or if you’d like to share your story and have a feature of your own, i would love to hear from you. 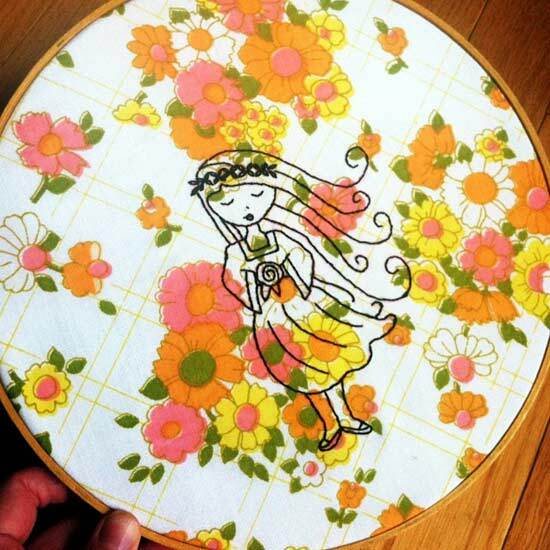 The above sweet stitchery is by Robyn from @shopsewrobyn and is made on a canvas of vintage sheets. 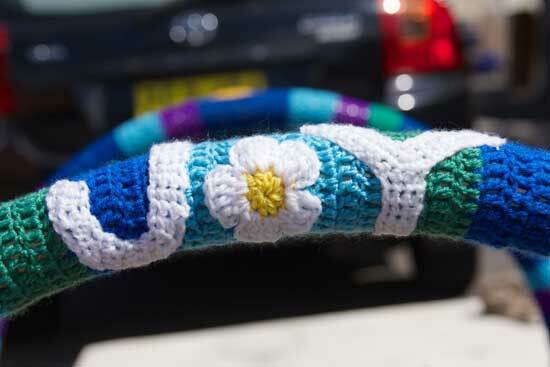 Robyn was kind enough to share her story with me – in October just past, she suffered a miscarriage and used her newly acquired skill of hand-embroidery to help her get through the waiting and recovering time. 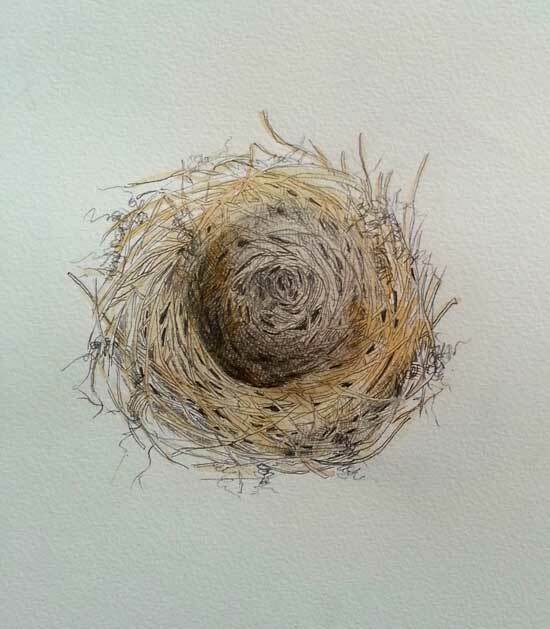 She said, “I could just sit and stitch and think as much or as little as i wanted, and have the comfort/satisfaction of making and completing something beautiful with my hands, even though my body had failed me in other ways at the time”. 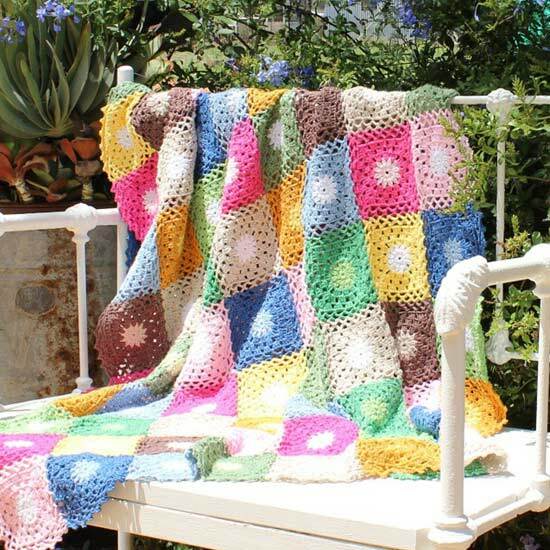 This beautiful crochet blanket is just one of the creative images you will find in the #craftastherapy feed. 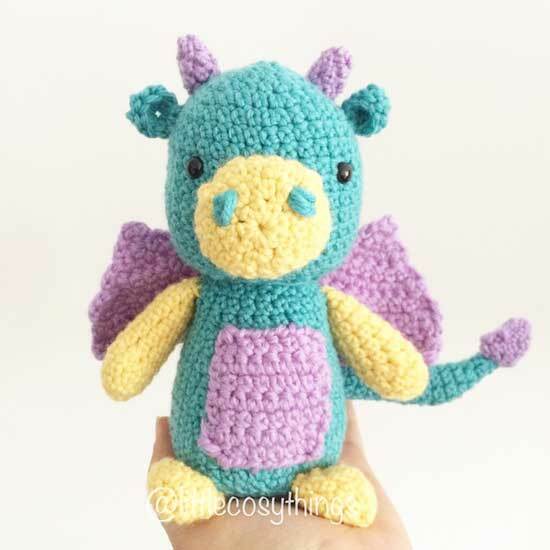 Robyn aka @crochetgirl99 is super talented with the hook and her own feed is full of stunning creations. She calls this project her “summer loving” blanket. This unique weave made by Anna aka @ansies also features in the #craftastherapy feed along with some of her other inspiring projects. 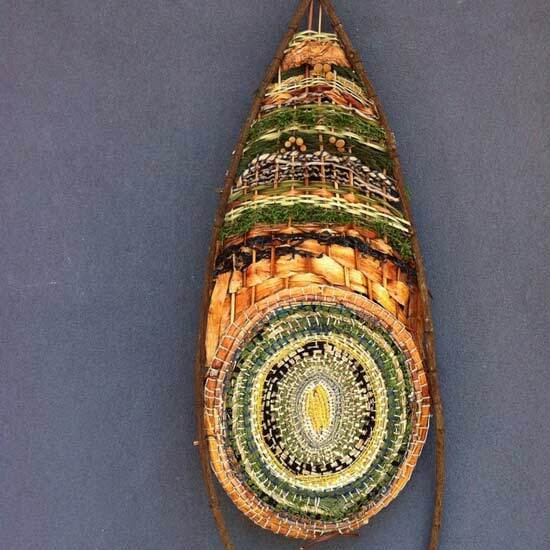 Her weaves are like nothing i have ever seen before and feature lots of natural and foraged materials. 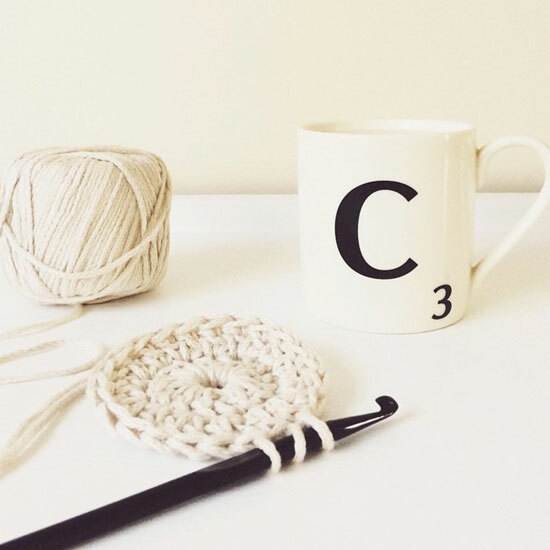 The above image is from Chaney, aka @lovemylittlebird – what could be more relaxing than crochet and a cup of coffee? Please check out the #craftastherapy feed on Instagram and be amazed by the creative and crafty people that are posting under the hashtag. 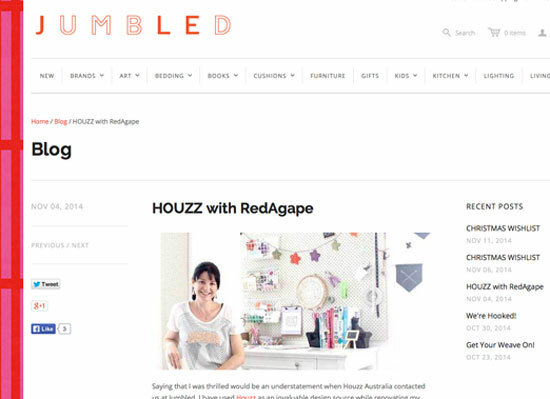 It is a visual feast of crafty projects plus a you will find loads of encouraging and supportive people there. 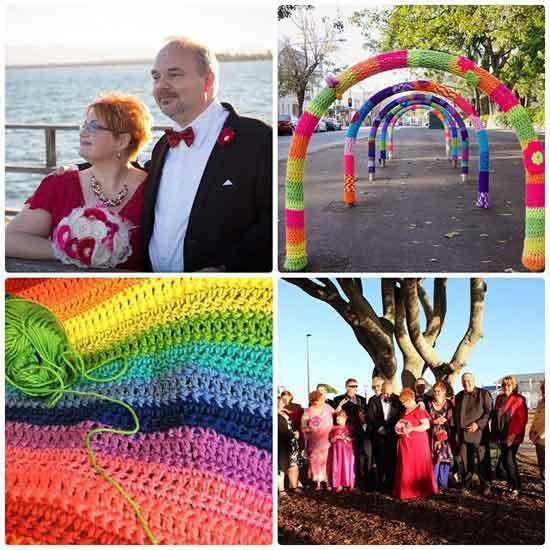 What a wonderful year 2014 has been! I will be taking a blog break until the new year, but i wanted to quickly say thank you to everyone who has encouraged and supported me throughout 2014. When i look back over the past year, i can honestly say that i can not remember a time when i was happier. The fresh new start at our property, Melancholy Hill, certainly set the tone for the rest of the year. The guesthouse has been a smashing success this year and with a few bookings already for 2015, i know the next year will be the same. Messages of thanks and happiness fill my guest book at RedAgape Guesthouse and i am so pleased to be able to share the beauty of Millthorpe with others. I have had so many new opportunities to further improve my photography, styling and writing over the last 12months. Thank you to those who have trusted me to produce good work, despite my lack of formal qualifications. The experience i have gained over the last year has been priceless. I have so much gratitude for a year of reasonably good health….something i NEVER take for granted. I am also extremely grateful for the good health of all those i hold dear. I hope this continues in 2015. This year i have finally been able to feel some resolution about losing my mother last year. I think of her everyday and I’m grateful for the pain because it makes me determined to fill every moment with as much happiness and joy as i can muster. I have loved watching three very special people, my children, grow a little more into totally inspiring human beings. They are so kind, thoughtful, bright and pure. I wish Mum could see how they’ve grown. I am unbelievably proud of them and everything they do. I also want to say goodbye to Ruby. Our dog of 15yrs was diagnosed with cancer on Saturday and sadly we had to put her to sleep. There were lots of tears on Saturday but we are consoled by the fact she has lived a long life and isn’t suffering anymore. The last year she spent at Melancholy Hill was probably her happiest too. Finally, Merry Christmas and a Happy new year to my readers. I am looking forward with great anticipation to 2015 – i have so much planned!!! 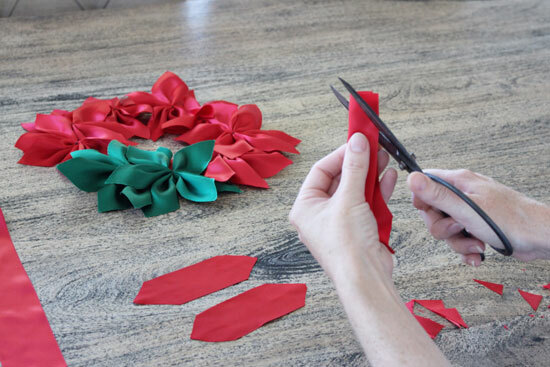 For each ribbon poinsettia you will need to cut three strips of ribbon approximately 15cm long. 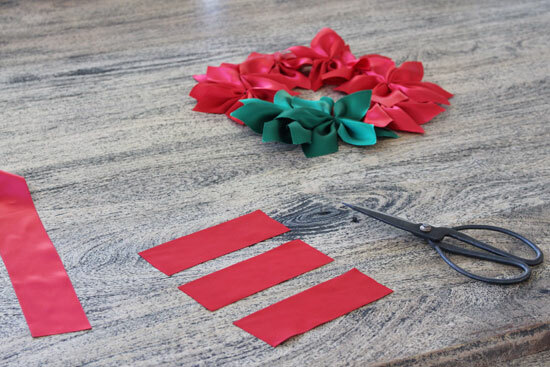 Cut the ends of the ribbon to form points – you will need to do this for both ends. 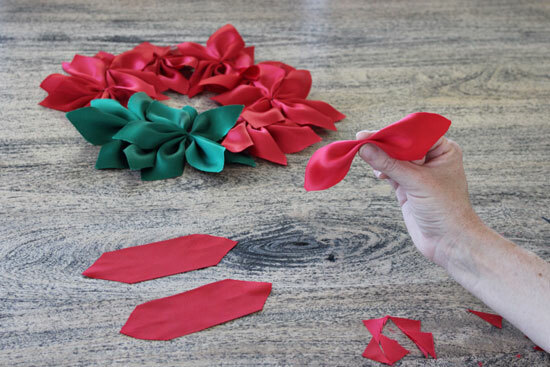 Fold each strip of ribbon like a concertina: fold in half and then fold the outer edges in opposite directions. 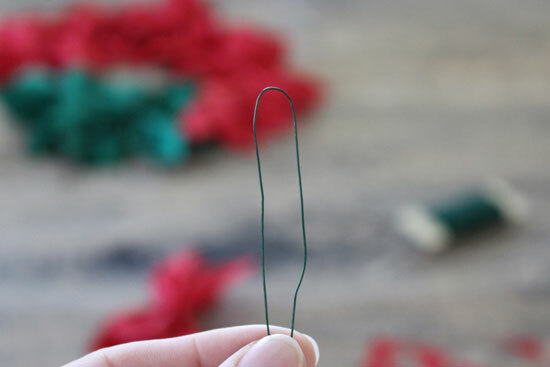 Your ribbon should look like a bow tie (see the image above) As you fold each strip thread them onto a pin to hold them in place until you are ready to secure them with wire. Take a piece of wire, also 15cm long and fold over so it resembles a hair pin. 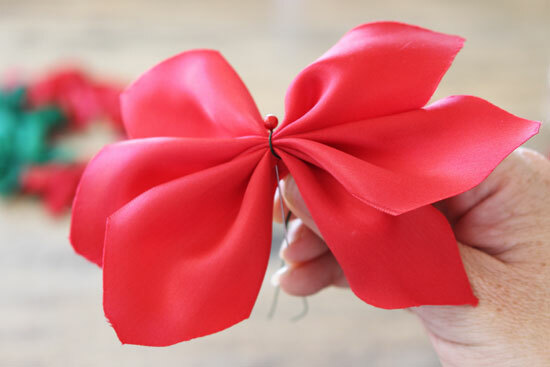 Put the wire over the centre of the three strips of ribbon and twist a couple of times at the back to make it secure. You can now remove the pin. Cross over your wires – this is the hardest part. If you look at the image above you can see the wire is attached in three different directions: one straight across (the first step of attaching the wire) and two in diagonally opposite directions. 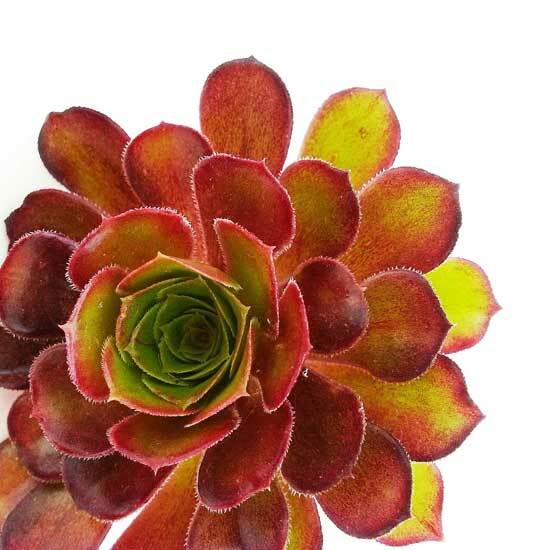 To make your first diagonal, take one of the ends of the wire from the back, separate your ‘petals’ and take the wire up through one pair of divided petals and down through the opposite pair of divided petals. Take the second end of the wire from the back and repeat the same steps on the opposite side. 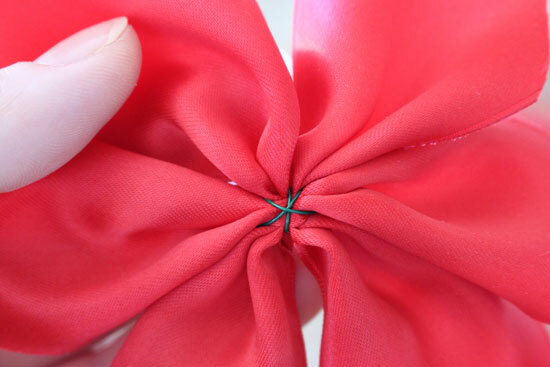 With both wire ends now at the back, give them a final couple of twists to make your flower secure. 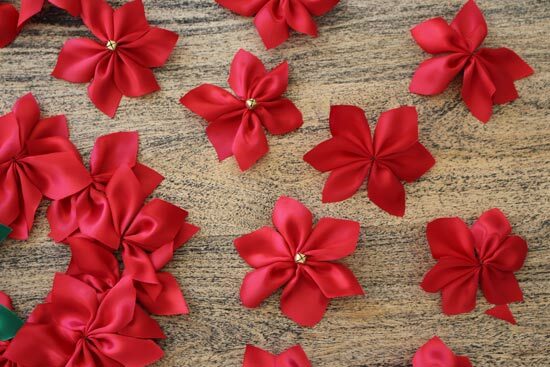 You can now play with your petals until you have achieved a look that you are happy with. 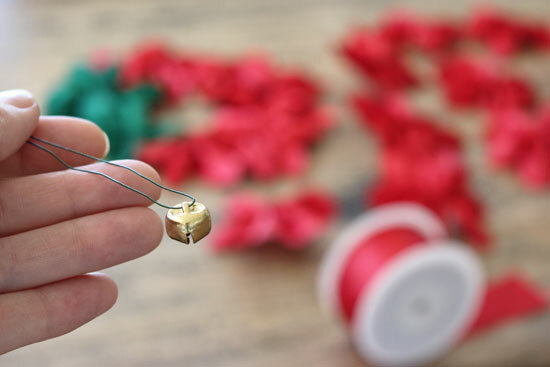 If you want to add beads or bells to the centre of your ribbon flower, simply add the embellishment at the wiring step. 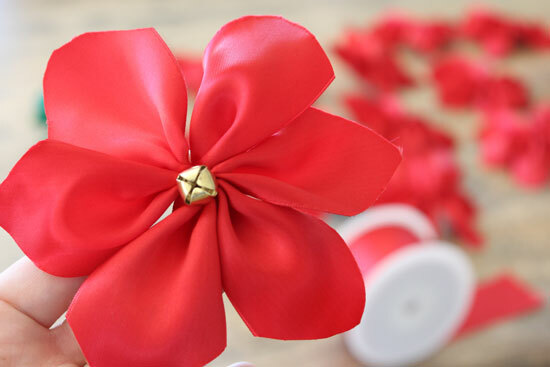 The rest of the ribbon is completed in the same way as the plain ribbon flowers. 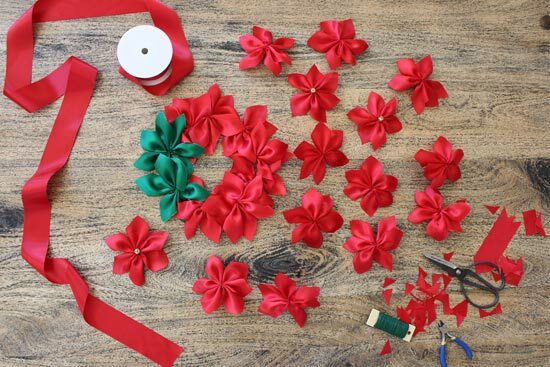 I made a lot of ribbon flowers in a short amount of time – enough for two wreaths. 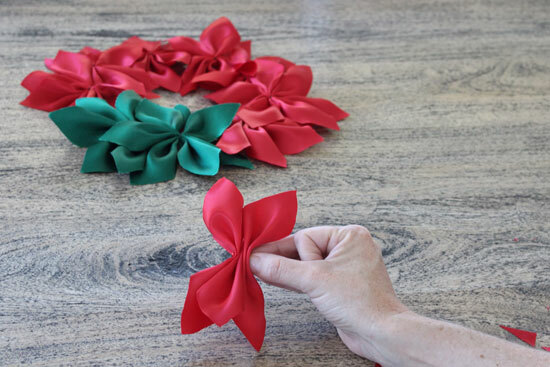 It is up to you how you choose to attach your ribbon poinsettias to make a wreath. I added my ribbon flowers to a gold wire hoop using my hot gue gun. 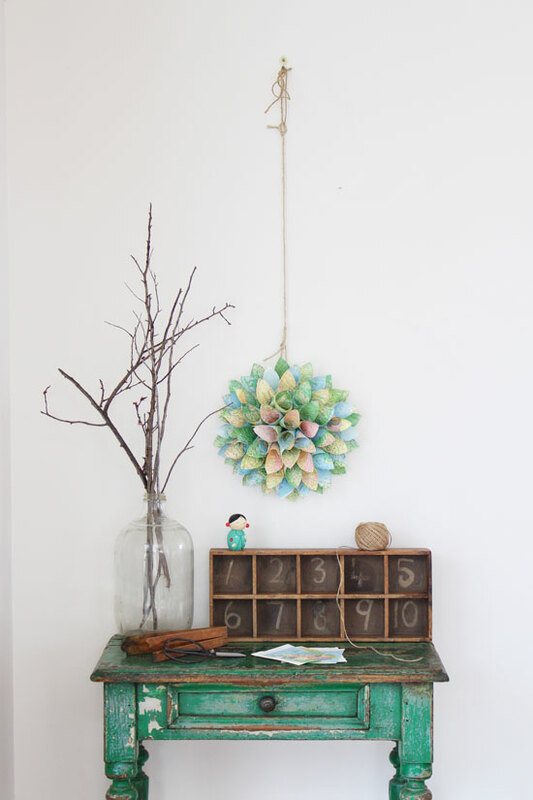 A similar method could be used regardless of what you choose for your wreath base. 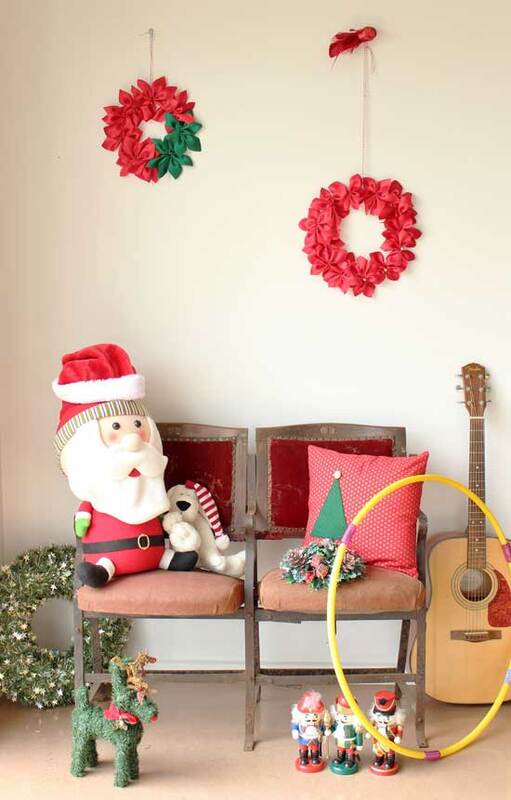 Here are my two Christmas wreaths hanging in our rumpus room. 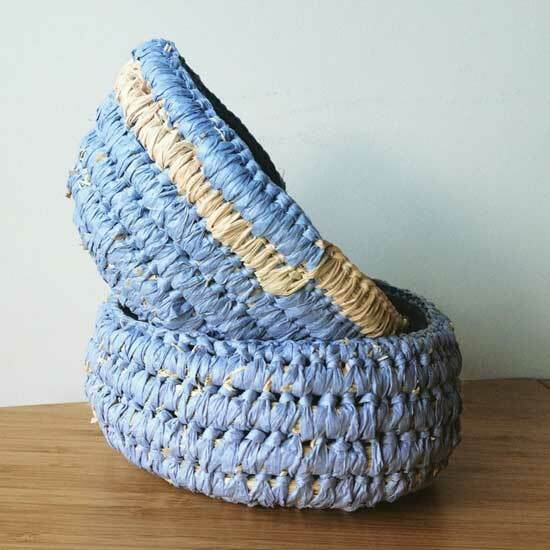 And there’s no reason you can’t make these in other colours and use them as gift toppers or hair bows. 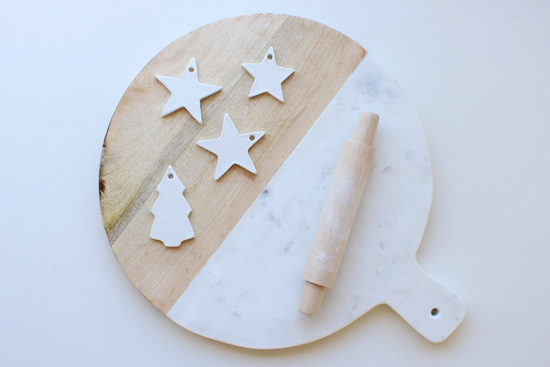 Join me on Instagram for other Christmas craft activities. Last week I was invited to run a Christmas craft activity for some local carers in our community. Carers are people who look after a friend or family member that is sick, disabled, elderly or mentally ill and unable to cope without support. Most carers are unpaid, work very hard and deal with high levels of stress. They can be any age, come from all walks of life and varying cultures, but one thing they do have in common is that they need a break sometimes. I am extremely enthusiastic about using craft as a form of therapy and tag of lot of my Instagram posts this way – #craftastherapy As a few of you know, I turned to craft in a massive way during 2013 as my mother neared the end of her battle with brain cancer. For me, it was a way to shield myself from the stress when it was getting too much. 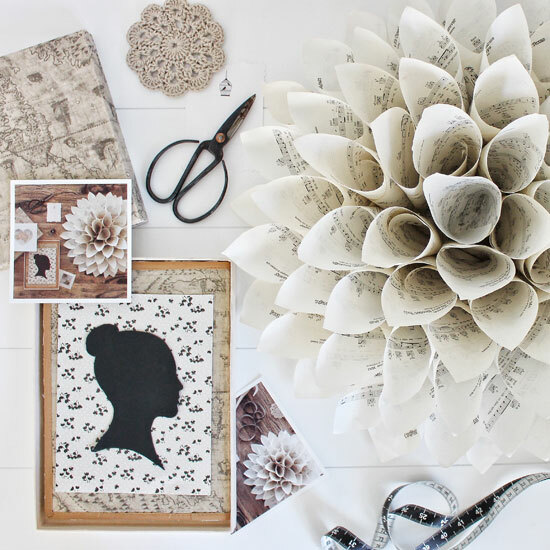 I’ve always loved craft but #craftastherapy began for me with my first Paper Cone Wreath. You can find an updated tutorial here. It seemed fitting that my first Carers Craft Group should start with a Christmas version of my paper cone wreath. The construction is identical to my standard wreath, but a gap is left in the centre to glue Christmas decorations. There are only three rounds, which makes it quicker and easier to construct. 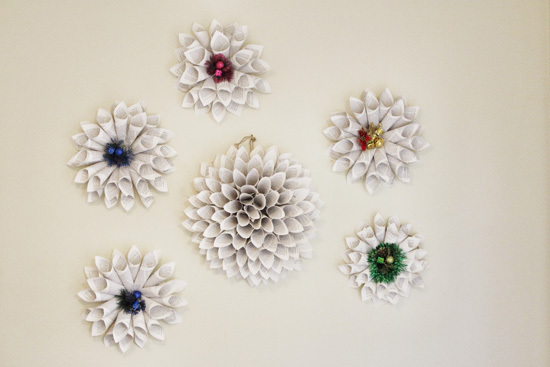 I am really happy with how they turned out and they all looked beautiful hung together in a cluster on this wall. 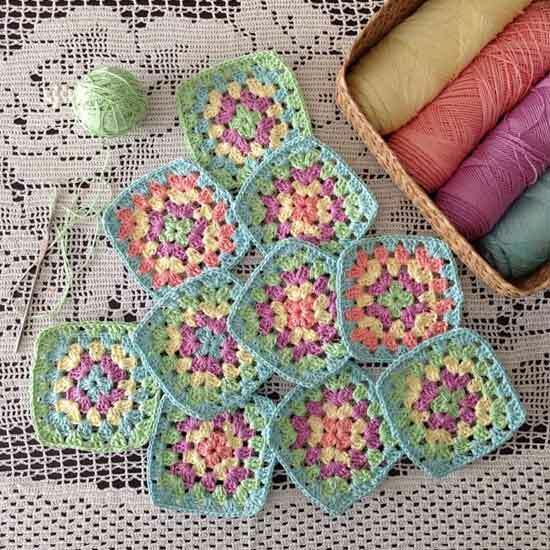 Please come and join me on instagram and hashtag your craft projects as #craftastherapy I would really love to see any craft activities that you have created to help get you through difficult times. 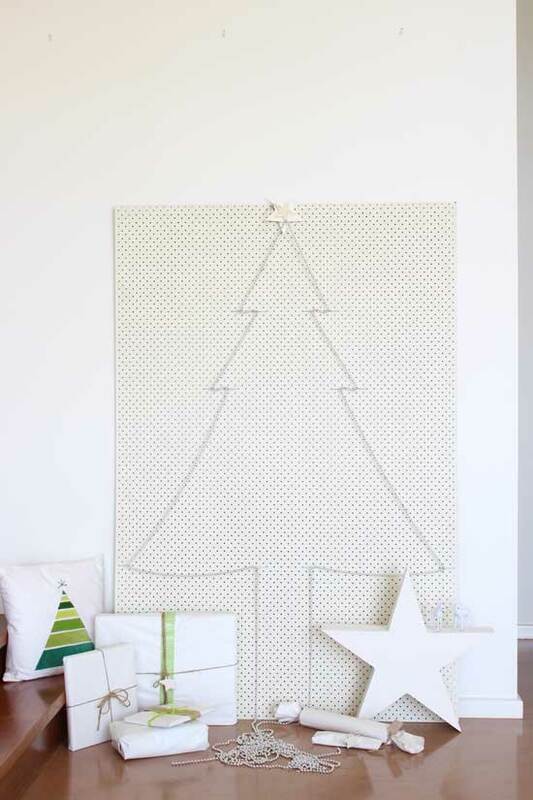 These pegboard Christmas tree ideas are great for anyone with limited space or just looking for an alternative to the typical store bought, fake green tree. 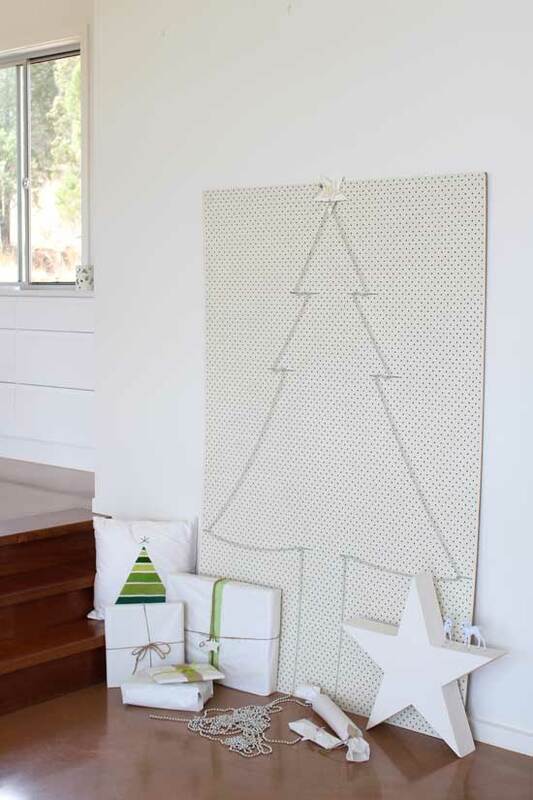 These ideas are quick and simple to construct and because the pegboard sits flat on the floor or hung on the wall, it is a space saving alternative to having a large Christmas tree. And this means more room for presents! Yay! 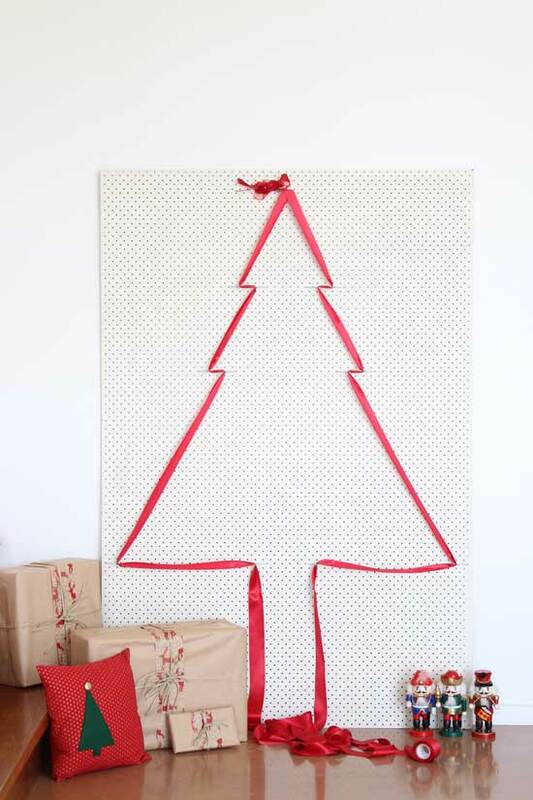 First up is my red ribbon tree – These are so simple to put together. 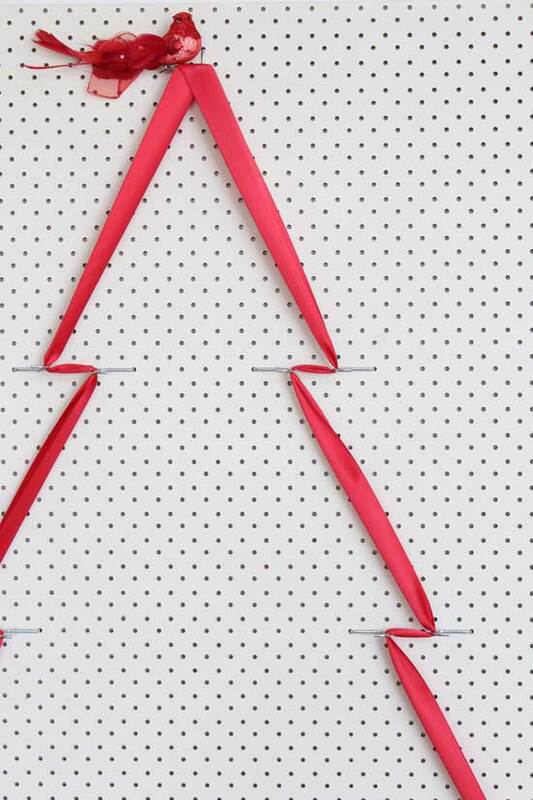 Using some pegboard hooks, mark out where you want the outline of your tree to go, and then run the ribbon around the hooks and let it fall in a lovely puddle at the bottom of the pegboard. 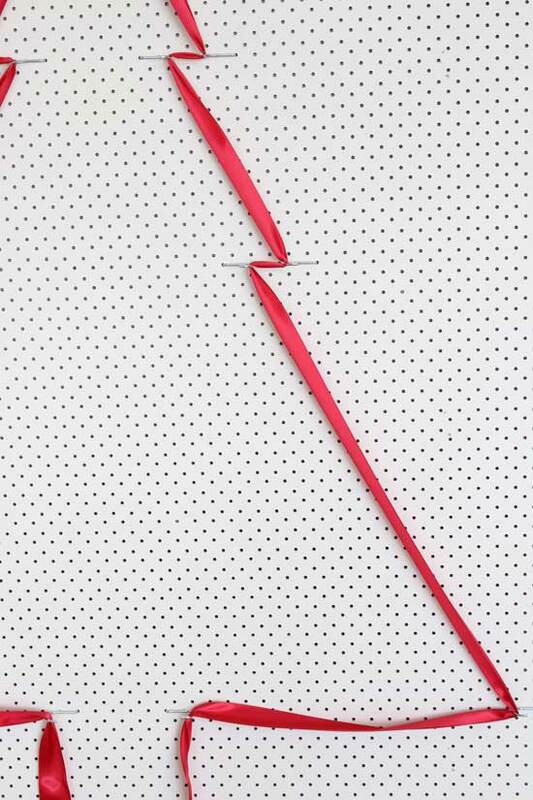 To make your corners, place two hooks in opposite directions and thread the ribbon in a zig zag motion around them. 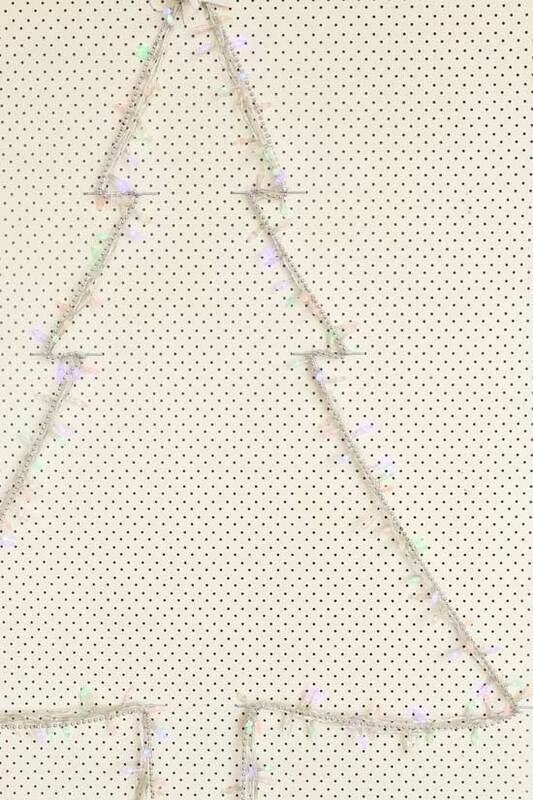 And there is no reason you can’t choose your own embellishment for the top of the tree. 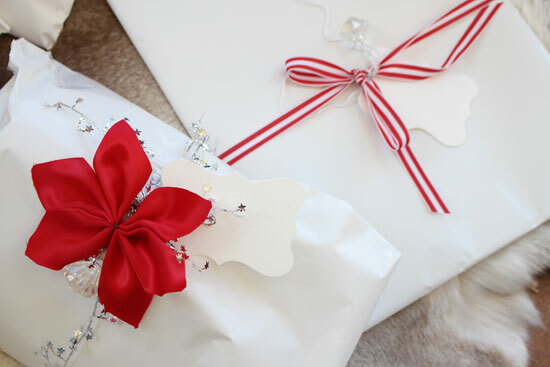 There are no hard and fast rules, so if you don’t want to use the traditional angel or star, find something else that appeals to you. 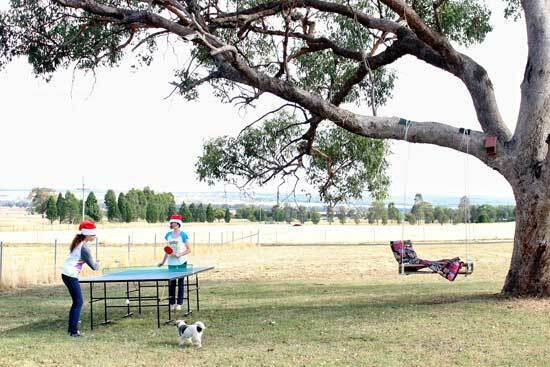 I have used a red bird on my tree top. 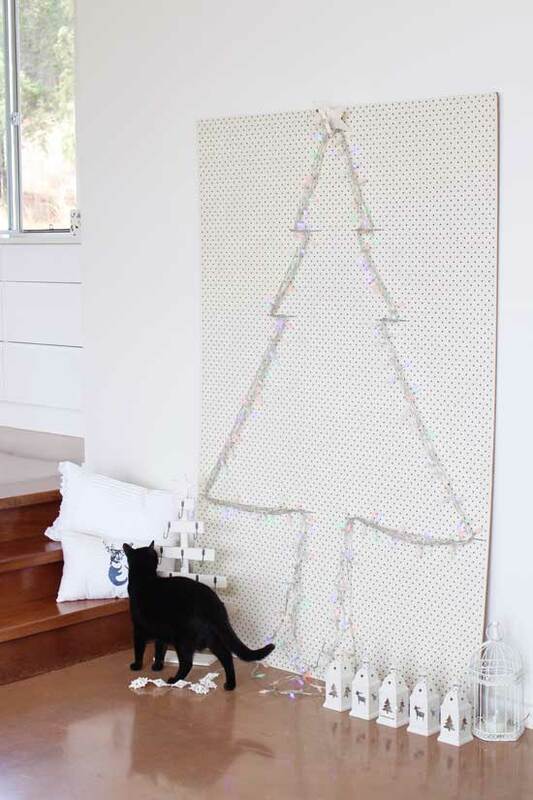 For my next tree i used a simple string of silver beads and a plain white star as the topper. 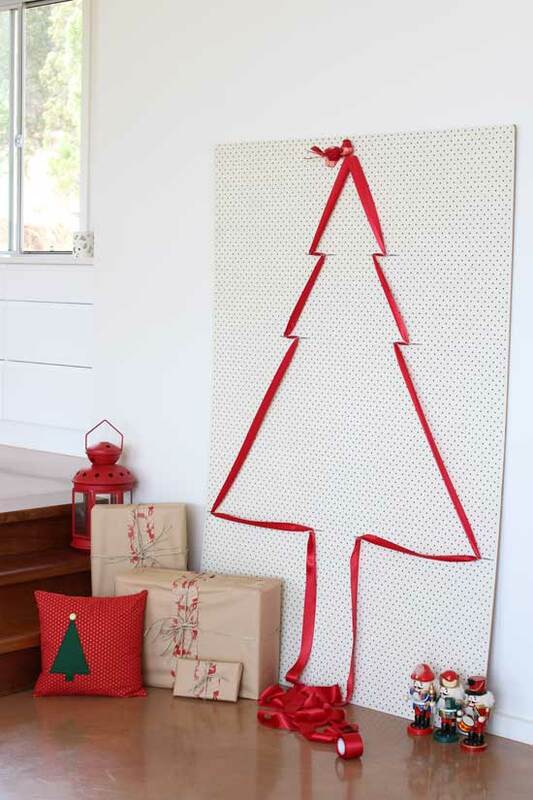 You could also use tinsel, jute string or a garland of felt balls as an alternative. 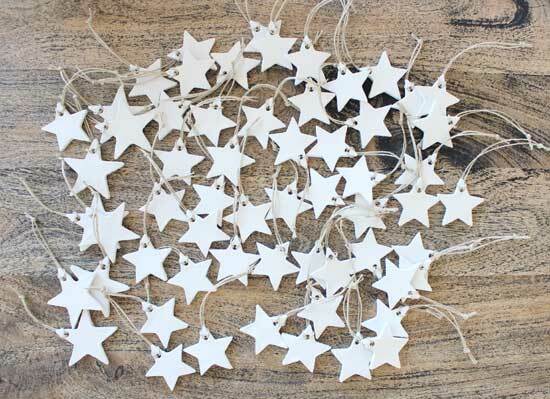 Nat at Little Puddles sells garlands in a variety of Christmas colours and they would be PERFECT for this project. 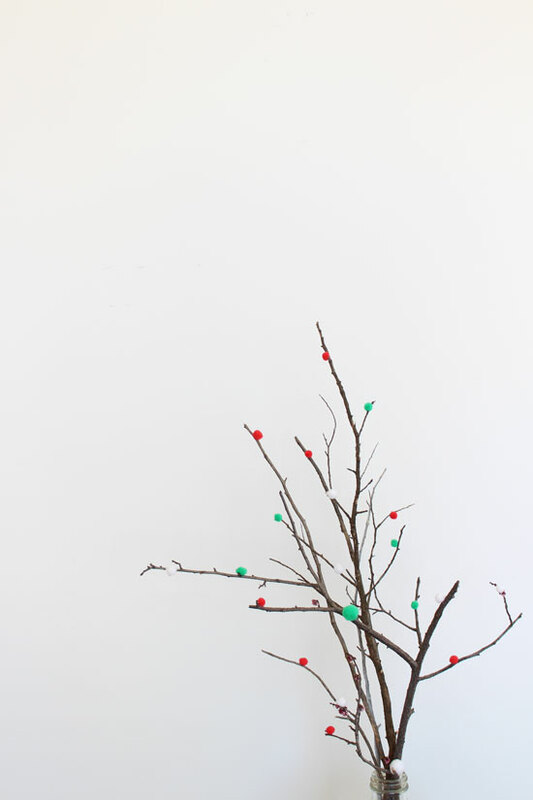 My Christmas budget is at its limit, so i may have to wait until next year to give the garlands a go. 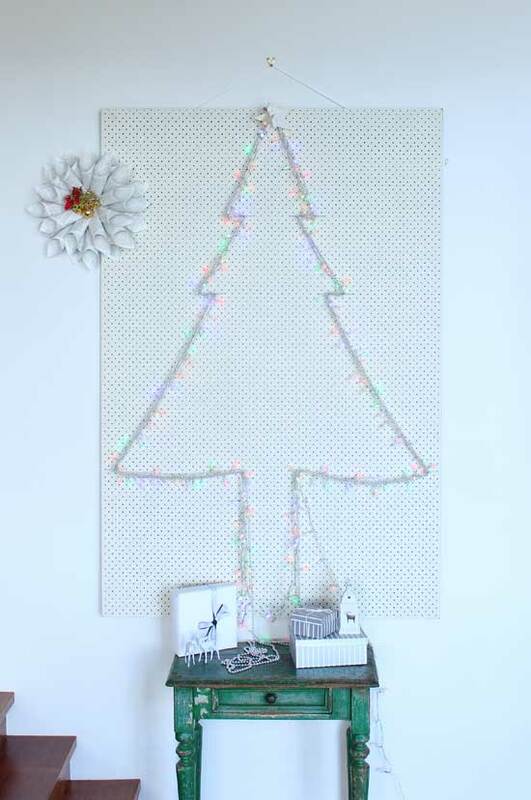 My last pegboard tree is made from a string of coloured lights. My string of lights was quite long, so i managed to wrap it around the tree outline three times. 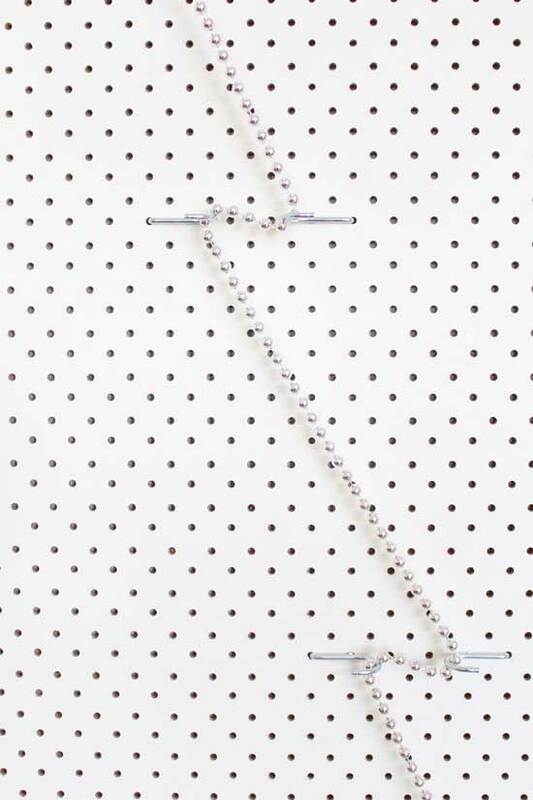 Make sure you buy lights that are on silver or clear wire, so that they blend in with the pegboard. 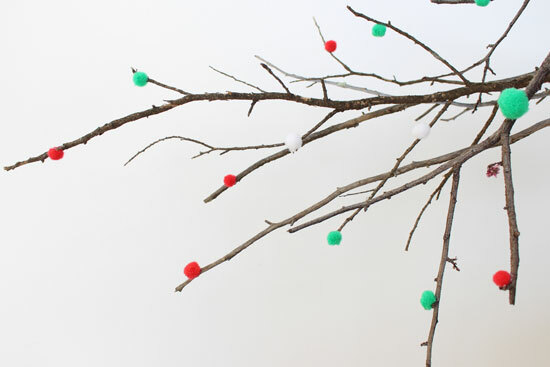 I’ve decided to stick with a combination of the lights and silver balls. 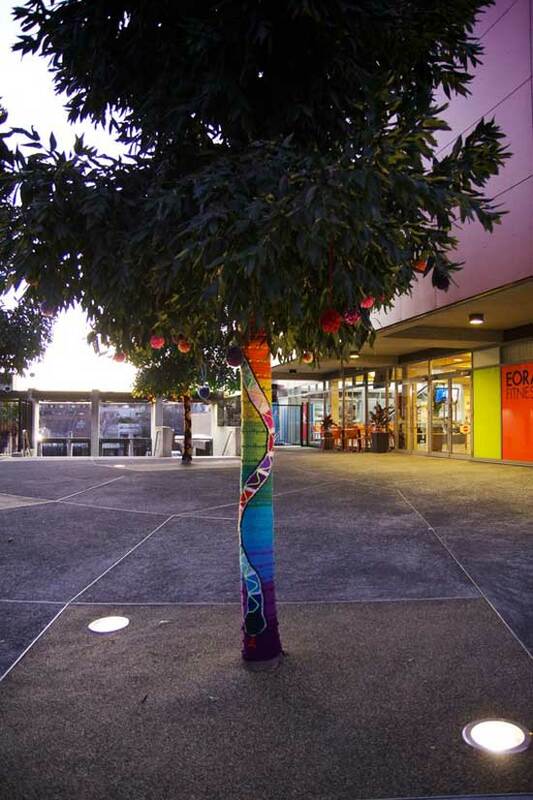 This way the tree looks pretty during the day as well as the evening when the lights are shining brightly. Photobomber Perry! Totally confused and unsettled by the constantly changing tree. What do you think? 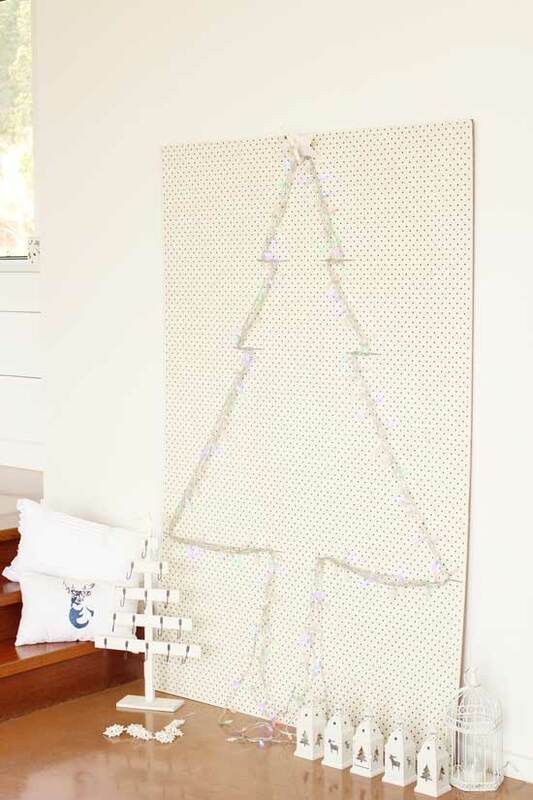 Would you consider a pegboard tree? 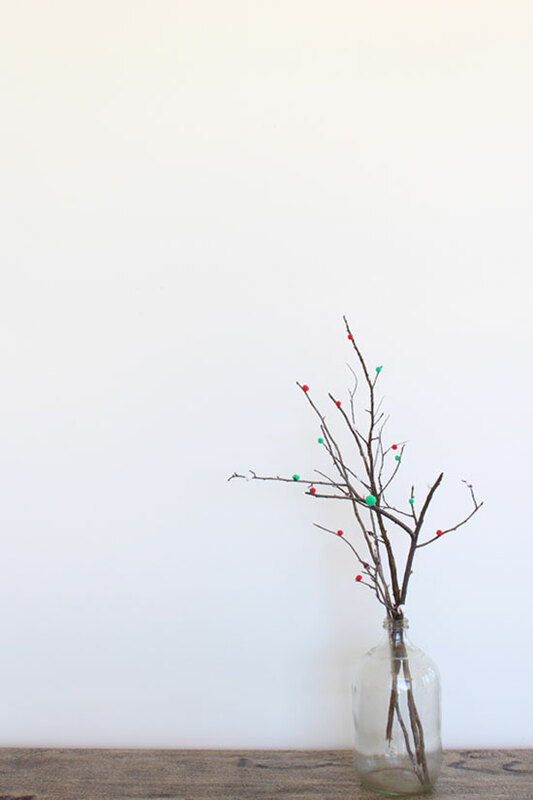 All you need is some pom poms, branches or twigs, a vase and a hot glue gun. Too easy! 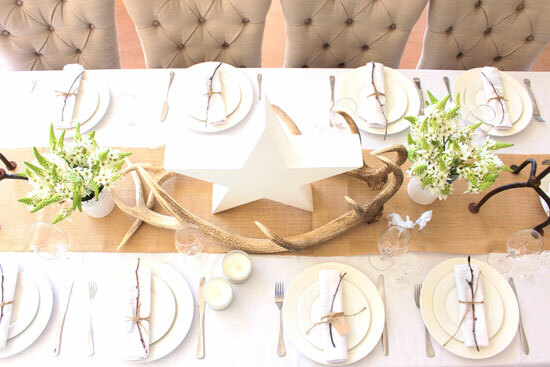 For more Christmas craft and styling ideas you can visit my Christmas Pinterest Board.